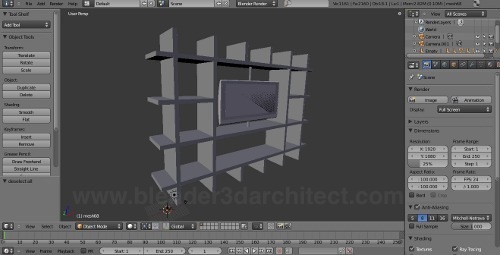 If you are using Blender 3D for architectural visualization for some time, you probably know that we donâ€™t have large libraries of furniture models available in the native Blender 3d file format. A good library of 3d models to use in architectural visualization projects is crucial to speed up the development of any project, and use the modeling time focusing on construction and architectural details of the project. One of the most expected new features developed as part of the SoC 2009 for Blender 3d 2.50 is the better support for the COLLADA file format. With the full support for COLLADA implemented in Blender 3D, we will be able to use models from one of the largest libraries of 3d models on the internet, the 3d warehouse. There are lots of free high quality furniture models available at the warehouse, even classic furniture models or furniture models based on contemporary design like Herman Miller chairs and IKEA kitchens. Both furniture models were downloaded from the warehouse. For testing purposes I downloaded five models, but only two of them acutely appeared on the 3D View. Models with complex details like office chairs and beds didnâ€™t showed up. Another strange thing is that all models only showed up with the draw mode in Solid. If I change it to wireframe everything disappears. And itâ€™s not possible to select and edit the object yet. This is perfectly normal, if we consider that this is only a test build. But, itâ€™s nice to see that itâ€™s already working with some furniture models from the warehouse. When the support is fully implemented with the B-Mesh system, I believe that all models from the warehouse and modeled in SketchUp, will be compatible with Blender 3D. Then, our work to populate a 3d model with furniture objects will be a lot easier. ItÂ´s an old script, but it works quite well. From my experiance the models from 3d warehouse mostly are NOT in highquality and not precise modeled (for example the eames plastic chair is modeled very sad !). You can not expect high quality if you don’t have to pay for it. BUT you even can pay models from Turbosquit, they are not expensive mostly in really high quality an very precise modeled. Think about the man-hours you need to model a high quality furniture and how mutch it costs on Turbosquit, so its worth of it to pay on turbosquid! I agree with your post. Still I’d like to add that the best models (and often most beautiful) can be found on some manufacturers sites. I particularly like B&B Italia and Arketipo, because they’re to my rather classic taste, but if you like totally sterile lofty interiors, there are Fritz Hansen, Flou, FjordFiesta, .. even Herman Miller’s site has models for download. Not all of them are superb quality, but often better than 3D Warehouse. The good thing about 3D Warehouse is that it’s easy to find stuff, where if you download from a manufacturer, you might often need to go through many pages before downloading. Since Sketchup 7.1 I can’t import the *.dae-files from sketchup into blender 2.492. There is always an error about the newer *.dae-filesversion. I have to export the files with an older sketchupversion to make it work. Does anybody of you have succes with the import/ export from sketchup to blender with the current versions ?